The Indian Space Research Organisation (ISRO) will launch an imaging satellite Microsat-R along with a student payload 'Kalamsat' from its spaceport in Sriharikota, Andhra Pradesh, on January 24, it announced on Thursday. "The 46th flight of Polar Satellite Launch Vehicle (PSLV-C44) will launch Microsat-R and Kalamsat from the first launch pad of the Satish Dhawan Space Centre at Sriharikota on January 24," the state-run space agency said in a statement on its website. The country's only spaceport is located at Sriharikota, about 90 km northeast of Chennai. The four-stage launch vehicle which has alternating solid and liquid stages, with two strap-on configuration has been identified for the mission and configuration designated as PSLV-DL, the statement said. 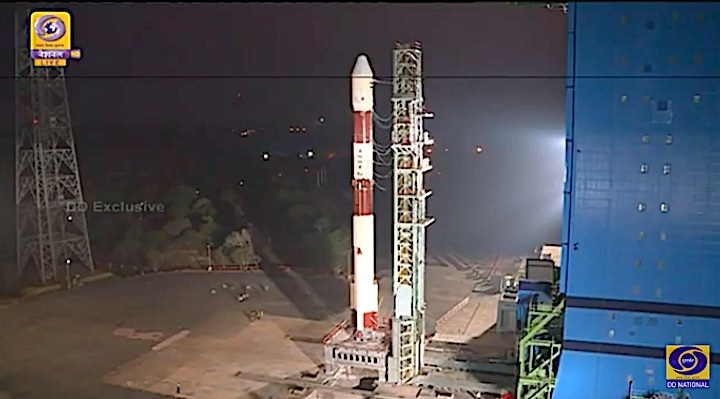 "PSLV-C44 is the first mission of PSLV-DL and is a new variant of PSLV," the agency said. 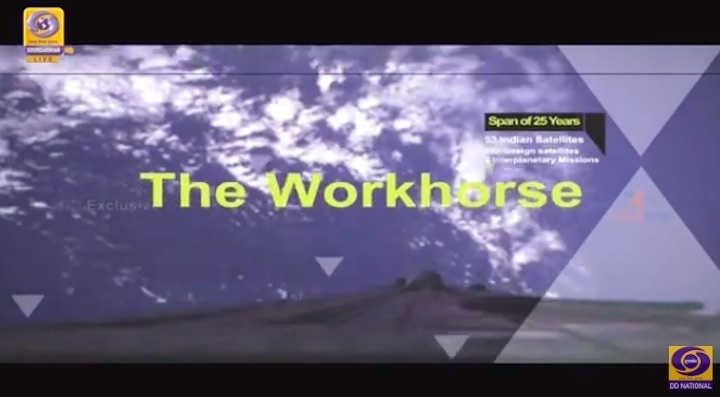 The fourth stage (PS4) of the vehicle will be moved to a higher circular orbit so as to establish an orbital platform for carrying out experiments, it added. The student payload 'Kalamsat' will be the first to use PS4 as an orbital platform. The world's lightest satellite made by Indian students will be carried on the back of a rocket launched by the ISRO today. It's on the house - not a single rupee will be charged by the Indian Space Research Organisation (ISRO) for the task. The satellite designed and built by students who work with a private organisation called "Space Kidz India" in Chennai weighs less than a wooden chair at only 1.26 kg. The Kalamsat-V2 is the lightest satellite in the world, the ISRO said, adding today's launch will also mark another milestone - it's the first satellite designed and built by an Indian private entity and Space Kidz India to be launched by ISRO. The main passenger in today's launch of the space agency's workhorse, Polar Satellite Launch Vehicle (PSLV), is a 740-kg satellite called Microsat-R that will be used to take high-resolution photos of the Earth for defence research. The 44.4-metre-long PSLV that weighs 260 tonnes will attempt to take both satellites into orbit on its 46th launch. The countdown began ahead of the launch from the Sriharikota spaceport in Andhra Pradesh. In its last mission on November 29 last year, the ISRO successfully placed India's Earth-observation satellite HysIS onboard the PSLV C43 into orbit. 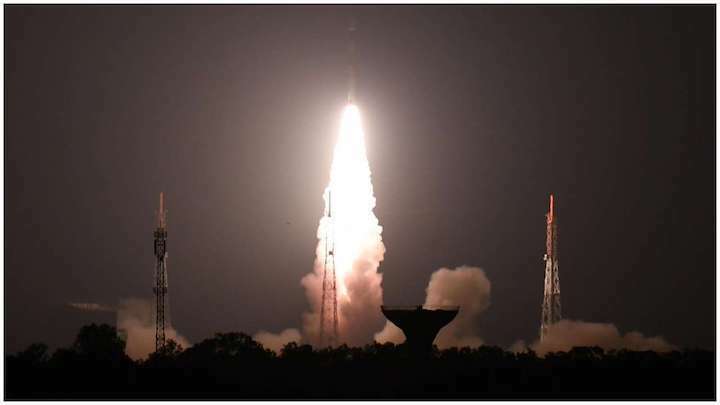 The 145-foot-tall (44-meter) PSLV lifted off from the Satish Dhawan Space Center, located on Sriharikota Island on India’s east coast, at 1807 GMT (1:07 p.m. EST) Thursday on the first Indian space launch of 2019. The launch occurred at 11:37 p.m. Indian Standard Time, making it a rare night launch from India’s spaceport. The primary payload on the flight was an Indian military Earth observation satellite named Microsat-R. 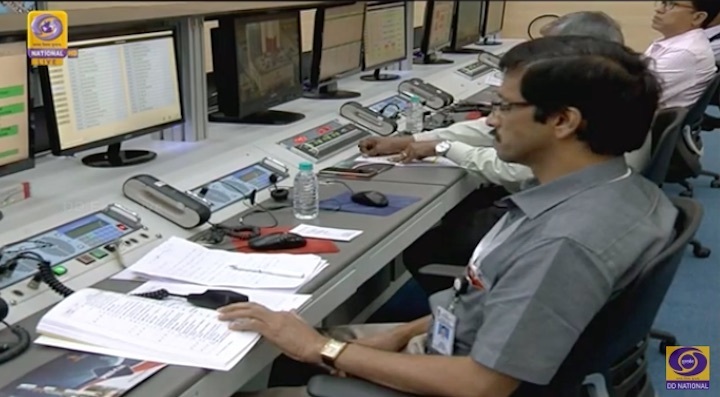 But a major objective of the launch was to demonstrate using the PSLV’s fourth stage as an experiment base in orbit after deploying the Microsat-R spacecraft. On previous PSLV missions, the liquid-fueled fourth stage was deactivated after finishing its satellite deployment sequence. Most other rockets do the same, either leaving their spent rocket stages in orbit or deorbiting them to burn up in Earth’s atmosphere. 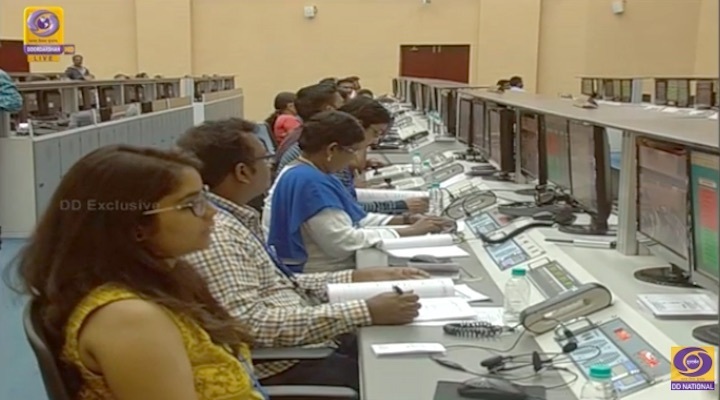 The Indian Space Research Organization, India’s national space agency, said the fourth stage on Thursday’s launch carried a payload developed by Indian students named Kalamsat. The tiny payload weighs only a couple of pounds and was planned to only be active around 15 hours after the launch before its batteries are drained, but future PSLV upper stages could include solar panels to generate electricity for longer experiment durations. Developed by a Chennai-based organization named Space Kidz India, the Kalamsat payload uses commercial off-the-shelf computer and communications systems and will broadcast data to Earth from the PSLV upper stage. A precursor experiment from Space Kidz India launched on a NASA-sponsored suborbital sounding rocket flight to space from Wallops Island, Virginia, in 2017. Thursday’s mission was also the first to use a new configuration of India’s Polar Satellite Launch Vehicle with two strap-on boosters. 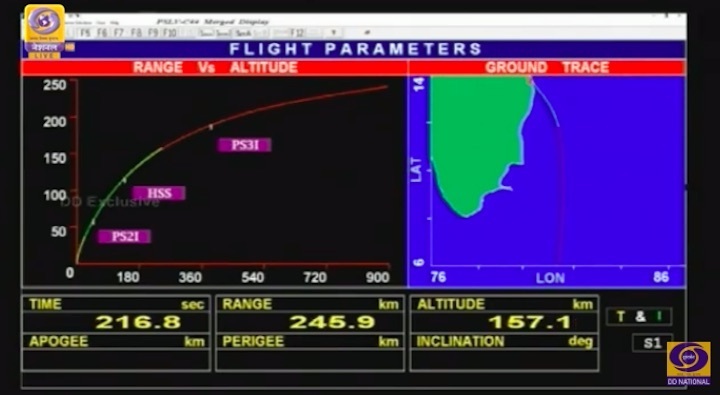 Previous PSLV flights used no boosters or flew with six motors to provide extra thrust at liftoff. The new rocket configuration, named the PSLV-DL, will give Indian officials an intermediate option to fly the rocket with fewer boosters if a mission does not need the full lifting performance of six strap-on motors, a measure that adds flexibility for ISRO managers and could save money. The PSLV’s solid rocket boosters burn around 12.2 metric tons — more than 26,000 pounds — of pre-packed solid propellant in the first 70 seconds of the flight, then jettison from the rocket’s core stage to fall into the Bay of Bengal. Each booster stands 39 feet (12 meters) tall and measures around 3.3 feet (1 meter) in diameter, generating approximately 158,000 pounds of thrust. 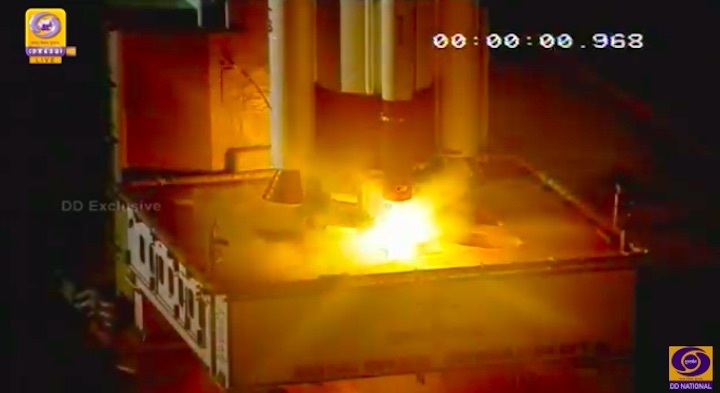 With two boosters supplementing the PSLV’s solid-fueled core stage, the PSLV-DL fired off the launch pad with around a million pounds of thrust. Heading on an initial track southeast from Sriharikota, the twin boosters separated around 70 seconds after liftoff, and the PSLV’s first stage burned out and jettison at T+plus 1 minute, 49 seconds, followed immediately by ignition of the rocket’s liquid-fueled second stage. The second stage’s Vikas engine, consuming hydrazine and nitrogen tetroxide, produced around 180,000 pounds of thrust for a two-and-a-half minute burn, during which the PSLV’s payload shroud released in a clamshell-like fashion once the launcher reaches space. After bending its trajectory toward the south to bypass an overflight of Sri Lanka, the PSLV fired its solid-fueled third stage next, followed by ignition of the twin-engine fourth stage — also burning hydrazine — at T+plus 8 minutes, 18 seconds. 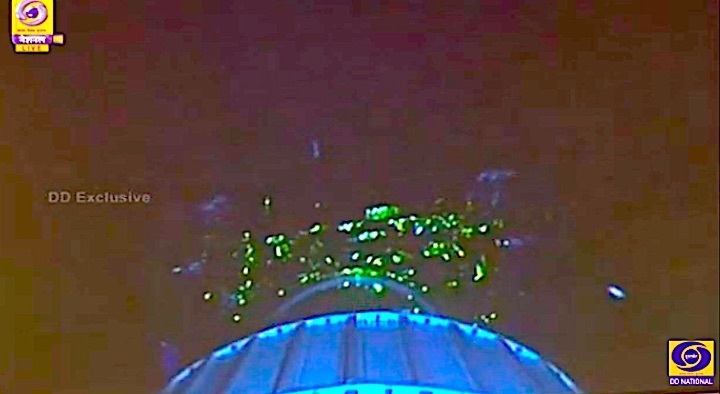 The fourth stage, known as the PS4, shut down at T+plus 12 minutes, 46 seconds, and deployed the Microsat-R spacecraft at T+plus 13 minutes, 33 seconds. ISRO officials confirmed the successful deployment of Microsat-R. The Hindu, an English-language newspaper in India, reported the Microsat-R satellite comes from the Defense Development and Research Organization — DDRO — the research and development agency of the Indian military. The roughly 1,631-pound (740-kilogram) satellite was to be deployed in an unusually-low orbit around 170 miles (274 kilometers) above Earth, the Hindu reported. 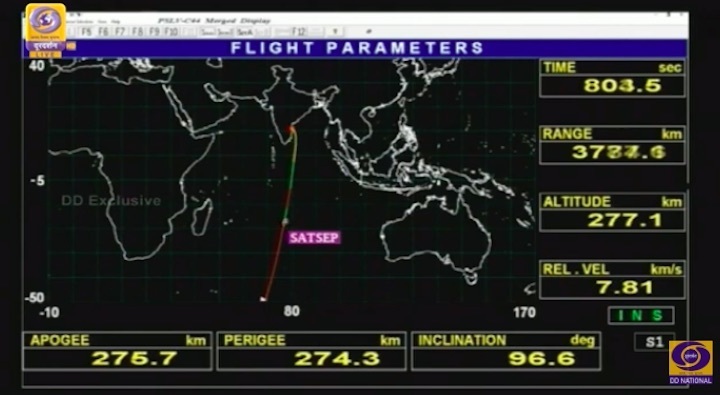 Microsat-R separated in an orbit inclined around 96.6 degrees to the equator, according to the ISRO press kit. Two additional burns by the PS4 fourth stage engines, each programmed to last around 15 seconds, were planned approximately 54 minutes and 1 hour, 40 minutes, after liftoff to raise the rocket’s orbit to an altitude of 279 miles (450 kilometers) at an inclination of 98.8 degrees. In that orbit, the fourth stage was to begin its mission as an experiment platform with the Kalamsat payload. Thursday’s launch marked the 46th flight of a Polar Satellite Launch Vehicle since 1993. All but two of the launches have been successful. India’s Polar Satellite Launch Vehicle deployed a military reconnaissance satellite and carried out a technology demonstration mission Thursday, flying in a new configuration and testing its upper stage as an experimental satellite platform. 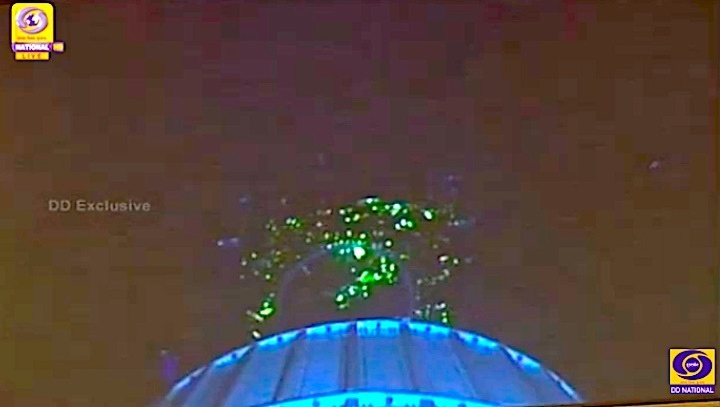 PSLV lifted off from the Satish Dhawan Space Centre at 23:38 local time (18:07 UTC). Thursday’s launch, the forty-sixth overall for the Polar Satellite Launch Vehicle (PSLV), marked the maiden flight of the rocket’s new PSLV-DL configuration. Filling a gap in payload capacity between two of the rocket’s existing configuration, the PSLV-DL will help reduce the cost of India’s access to space. Its first payload consists of a demonstration satellite built around the rocket’s upper stage, testing this concept for future applications, and a military spacecraft with an imaging payload. The PSLV that performed Thursday’s launch was vehicle number C44. PSLV was developed by the Indian Space Research Organisation (ISRO) and first flew in September 1993. 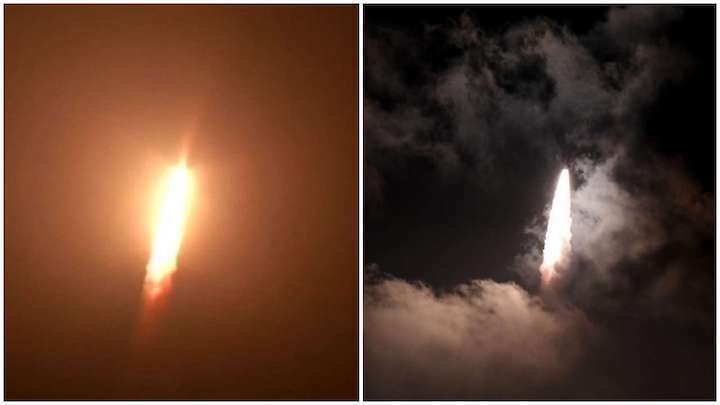 It was the third rocket that ISRO developed to launch satellites, following on from the earlier Satellite Launch Vehicle (SLV) and Augmented Satellite Launch Vehicle (ASLV). The four-stage rocket uses a mixture of solid and liquid-fuelled propulsion. The name Polar Satellite Launch Vehicle reflects that the rocket was originally designed for missions to near-polar sun-synchronous orbits, commonly used for Earth observation and low Earth orbit scientific satellites as well as for many other missions. Despite this PSLV has frequently been used to deploy spacecraft to other orbits, including geosynchronous communications, weather and navigation satellites and probes bound for the Moon and Mars. 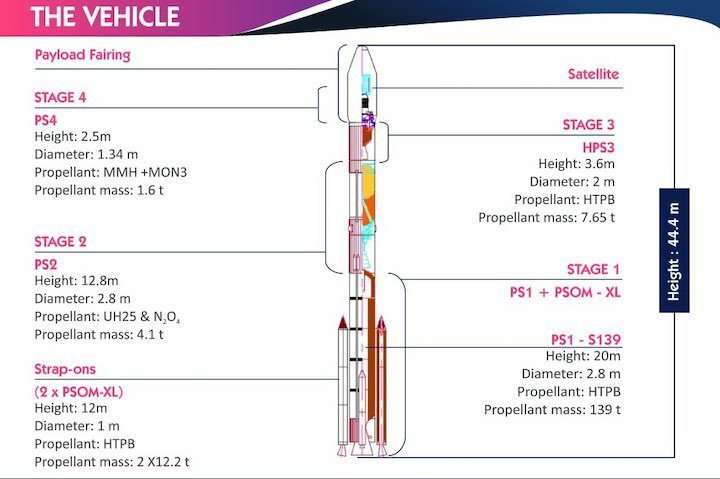 Prior to Thursday’s introduction of the PSLV-DL, the PSLV has flown in three different configurations. All of these have the same four stages at their core, varying the boosters that are strapped to the first stage of the vehicle. PSLV’s first stage, the PS1, uses an S-138 solid rocket motor. The liquid-fuelled second stage, known as PS2 or L-40, is powered by a Vikas-4B engine. Another solid motor, an S-7, comprises the third stage or HPS3. The rocket’s fourth stage – PS4 or L-2.5 – has two restartable liquid-fuelled engines for precise orbital insertion. This combination of stages has been standardized since the early 2000s. 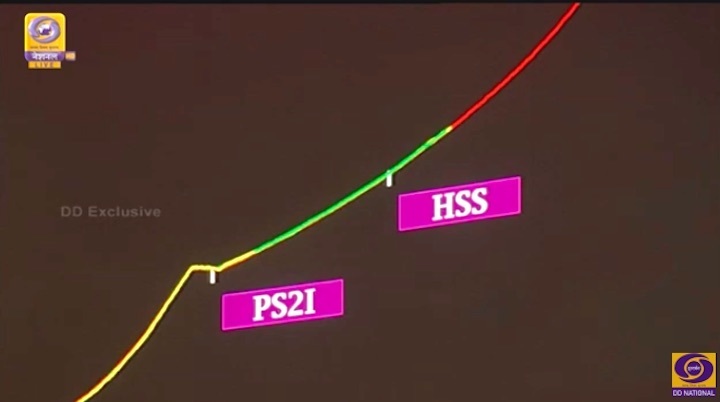 For the first few launches, developmental versions of PSLV had used smaller versions of the first, second and fourth stages: S-125, L-37.5 and L-2 respectively. The original PSLV configuration – now known as the PSLV-G – also used six PS0M strap-on boosters. These were based on the first stage of the SLV and first two stages of the ASLV. On a typical mission, four boosters would ignite on the ground with the remaining two igniting 25 seconds after liftoff. In April 2007, ISRO introduced the PSLV-CA, or Core Alone, which omits the boosters to deliver smaller payloads to orbit at a lower cost. The third PSLV configuration is the PSLV-XL, which was first used in the October 2008 launch of India’s first Lunar probe, Chandrayaan-1. This uses six stretched PS0M-XL boosters with S-12 motors in place of the PS0Ms, increasing the rocket’s ability to carry heavier payloads to higher orbits. To reduce production costs, ISRO is now standardizing on these more powerful boosters, although it is unclear if the PSLV-G still has any flights remaining before it is retired: it last flew in September 2016. The PSLV-DL uses the same core vehicle as the PSLV-G, CA and XL. However, two PS0M-XL motors are attached to the first stage and will ignite at liftoff. This gives the PSLV-DL a payload capacity between that of the unaugmented PSLV-CA and the PSLV-XL with its six boosters, accommodating some of the payloads that would previously have used the PSLV-G configuration or would have required an XL if this was not available. In its forty-five flights to date, PSLV has flown twelve times in the PSLV-G configuration, thirteen times as a PSLV-CA, and twenty times as a PSLV-XL. Forty-two of the rocket’s launches have been successful: the maiden flight failed to reach orbit after a guidance malfunction caused the rocket to go off course and the first operational launch in 1997 reached a lower-than-planned orbit although its payload, IRS-1D, was still able to complete its mission. 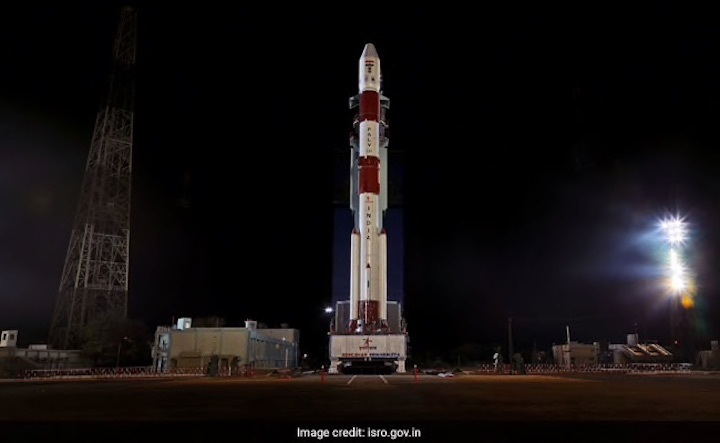 PSLV’s most recent failure came in August 2017 – ending a string of 36 consecutive successes – when the rocket’s payload fairing failed to separate from around the IRNSS-1H satellite. PSLV is the most flown and most reliable rocket that ISRO has developed to date. PSLV can launch from either the First Launch Pad (FLP) or Second Launch Pad (SLP) at the Satish Dhawan Space Centre(SDSC), a launch site on Sriharikota island that was originally named the Sriharikota High Altitude Range (SHAR). The launch site was renamed after former ISRO Chairman Satish Dhawan following his death in 2002. 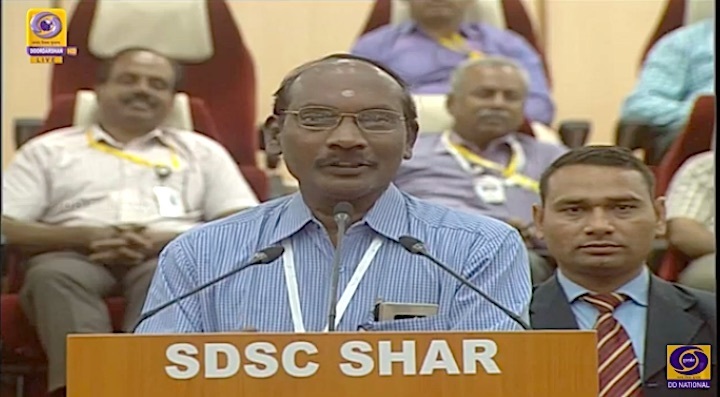 SDSC has been the launch site for all of India’s orbital launches – supporting SLV and ASLV missions from now-disused launch complexes to the south of the modern pads that are shared by PSLV and GSLV. Thursday’s launch, which used the First Launch Pad, was the sixty-ninth orbital launch from the site. Rockets launched from the First Launch Pad are assembled vertically at the pad, using a mobile service tower to provide access to the vehicle as it is stacked in place. The launch complex is expected to enter a period of renovation in the near future that will see it adopt the same flow as the Second Launch Pad, where rockets are integrated away from the launch pad and transported into position atop a mobile launch platform. 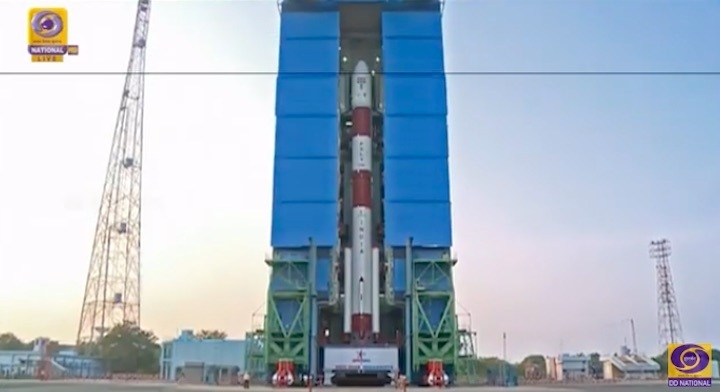 ISRO has stated that the primary objective of Thursday’s launch is to validate the PS4 Orbital Platform, using PSLV’s fourth stage as the basis for small satellites. This concept will be tested by Kalamsat, a student-developed experiment package that is attached to the fourth stage. Thursday’s launch was also used to deploy a military imaging satellite, Microsat-R.
Kalamsat was placed into a circular orbit at an altitude of 450 kilometers (280 miles, 243 nautical miles) and an inclination of 98.8 degrees. Powered by batteries housed within the PS4 stage, the satellite is expected to operate for about fifteen hours. As well as testing the concept of building a satellite around the PS4, this mission will likely continue research that was conducted with the launch of a suborbital Kalamsat aboard a NASA sounding rocket in 2017. Launched aboard a Terrier-Orion rocket from the Wallops Flight Facility, this mission tested a 64-gram (2.3-ounce) spacecraft constructed from 3D-printed carbon fiber polymers. Microsat-R was built and will be operated by India’s Defence Research and Development Organisation (DRDO). It is a 740-kilogram (1,630 lb) satellite bound for a 274 kilometer (170-mile, 148-nautical-mile) orbit inclined at 96.6 degrees. Operating in a lower orbit than India’s existing reconnaissance satellites, Microsat-R is likely carrying a high-resolution imaging payload for either experimental purposes or operational surveillance. Due to the military nature of its mission, ISRO has made few details of this satellite public. While Kalamsat is officially the primary payload for the PSLV C44 mission, this may simply be to draw attention away from the Microsat-R spacecraft and its national security objectives. Microsat-R is significantly larger than Kalamsat and is expected to remain in service long after Kalamsat completes operations. 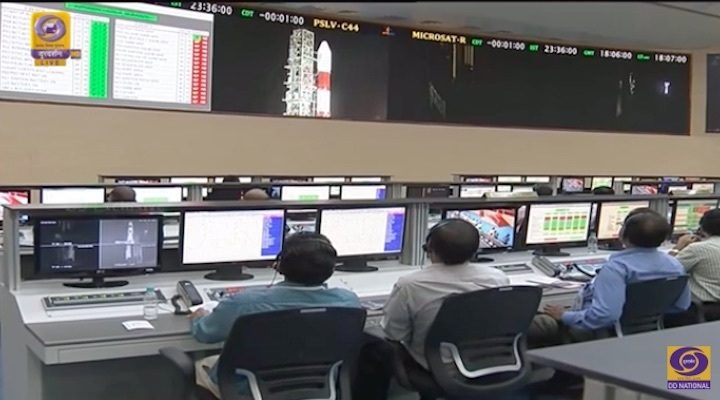 Thursday’s mission began with ignition of the PSLV’s first stage engines at the zero mark in the countdown. 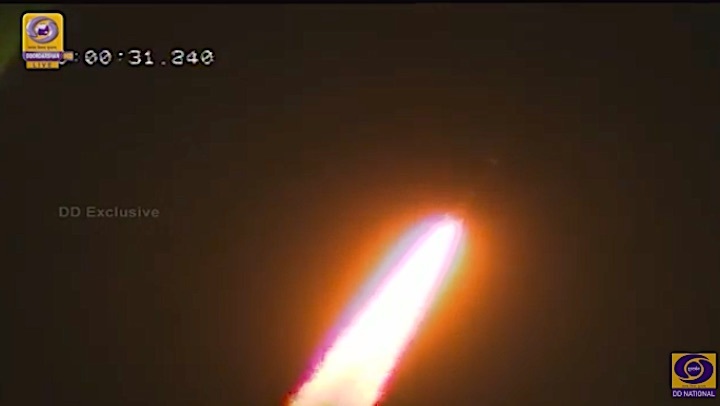 The two boosters lit up 0.42 seconds later, and PSLV C44 began its ascent. Climbing out of Sriharikota on an azimuth of 140 degrees, the first major in-flight event occurred about 70 seconds after liftoff when the boosters exhausted their propellant and separated from the rocket. 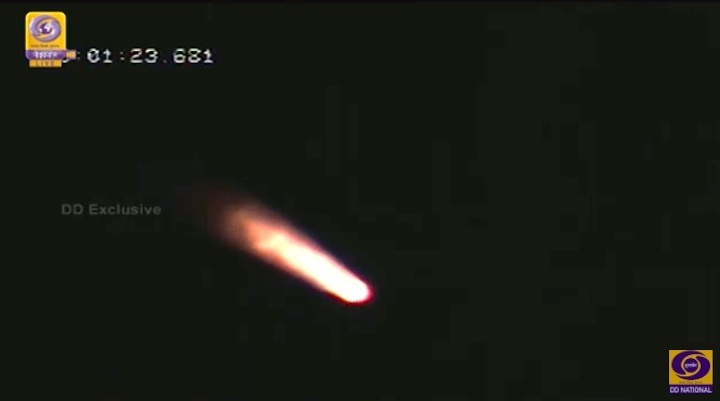 PSLV’s first stage continued burning for another 40 seconds before it too burned out and separated. 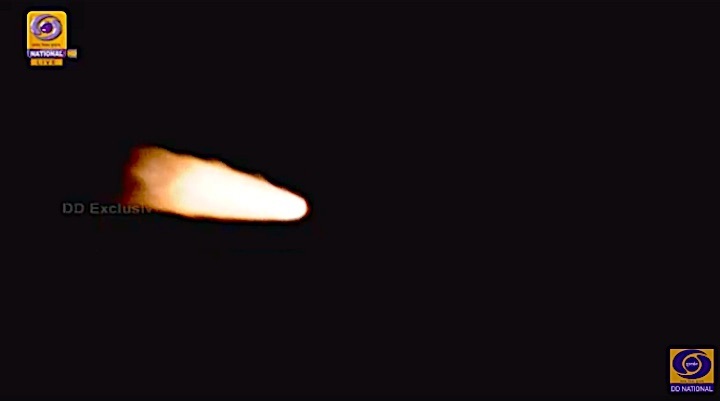 Two tenths of a second after first stage separation, the Vikas engine powering the rocket’s second stage ignited. Vikas is a license-built derivative of the French Viking engine that powered earlier versions of the Ariane rocket, up to the Ariane 4. It burns UH25 – a mixture of unsymmetrical dimethylhydrazine and hydrazine hydrate – oxidized by dinitrogen tetroxide. 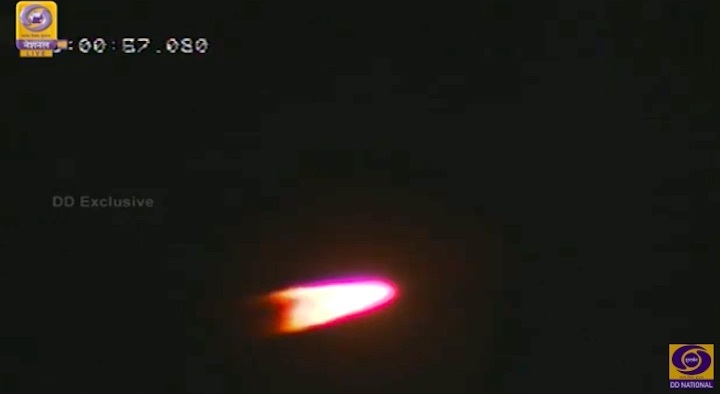 The second stage fired for two and a half minutes, with separation of PSLV’s payload fairing – termed a heat shield by ISRO – occurring fifty-nine seconds into the burn. 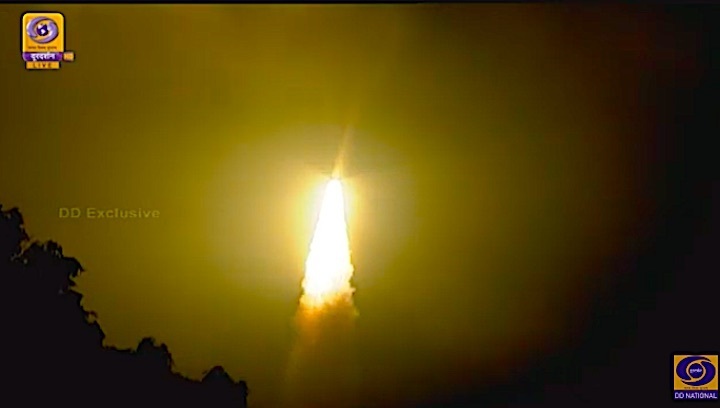 PSLV’s solid-fuelled third stage ignited 1.2 seconds after it separated from the second stage, with its burn lasted about 70 seconds. After third stage burnout the mission entered a coast phase as the rocket climbed towards its trajectory’s highest point, or apogee. After coasting for about two and a half minutes the spent third stage was jettisoned, and the fourth stage ignited about ten seconds after separation for the first of its three planned burns. This first burn of the upper stage lasted four minutes and 28 seconds, placing Microsat-R into its deployment orbit. 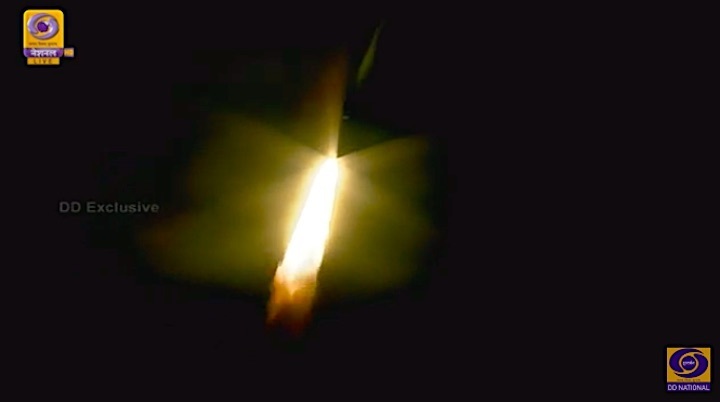 Forty-seven seconds after the end of the burn, Microsat-R separated from the PSLV. Once Microsat-R was released, PSLV C44’s mission entered an extended coast phase for the next 41 minutes and two seconds. 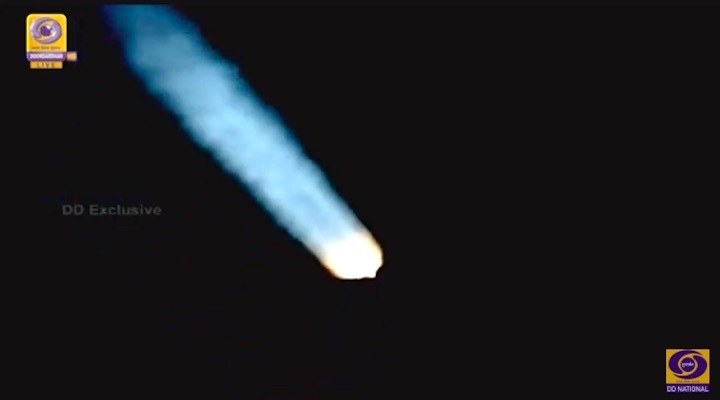 Following the coast, a sixteen-second engine burn raised the apogee of the fourth stage’s orbit. The stage remained in this intermediate orbit for 45 minutes and 35 seconds, completing half a revolution around the Earth before restarting again. The final fifteen-second burn circularised the upper stage’s orbit by raising its perigee. Approximately 110 seconds after cutoff – one hour, 42 minutes and 31 seconds after liftoff – Kalamsat began its investigation. The payload is expected to operate for about thirteen and a quarter hours, running out of power about fifteen hours after liftoff. 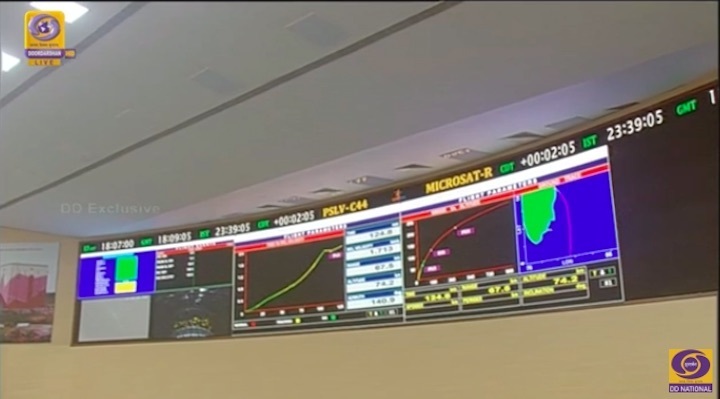 Thursday’s launch was the first of 2019 for India, coming five weeks after ISRO’s previous launch saw a GSLV rocket deploy the GSAT-7A satellite successfully. India’s next launch is currently expected sometime in February, with another PSLV deploying the EMISAT electronic surveillance satellite along with a secondary payload of small satellites. On Thursday, ISRO's PSLV C44 lifted off from the Satish Dhawan Space Centre, Sriharikota, carrying India's satellite Microsat-R and students' payload Kalamsat. 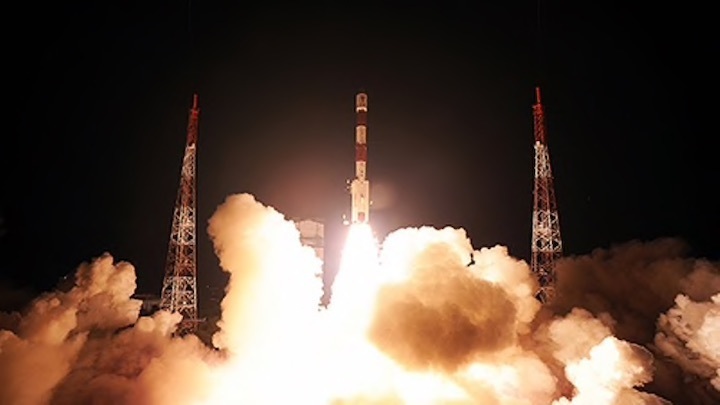 In the first mission for the ISRO in 2019, India successfully launched Microsat-R, a military satellite on board its Polar rocket PSLV C44, and Kalamsat, a nanosatellite developed by students.